This larger version of the Hobie Livewell Bait Tank can carry up to 11 gallons of water and features an extra wide hatch for easy access to live bait. The Livewell XL will only fit on Hobie Pro Angler Series (12, 14 & 17T) kayaks. It cannot fit the rest of the Hobie Mirage line. 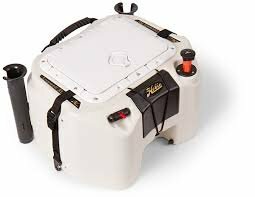 The Livewell XL also sports several new features such as a corrosion resistant, magnetic housed switch. The water level in the Livewell XL can be also be adjusted using the included "C-CLip." Draining the bait tank is as easy as twisting the red knob on the top. The Livewell XL comes with 2 built in rod holders, as well as two extra ones ready to be installed onto the tank. It can hold up to 11 additional rod holders. One 6V sealed gel cell battery and a 6V charger are also included with this bait tank.